Starring John David Washington, Adam Driver, Laura Harrier, Topher Grace, Jasper Paakkonen, Robert John Burke, Corey Hawkins, Ryan Eggold, Michael Joseph Buscemi, Paul Walter Hauser, Ashlie Atkinson, Arthur J. Nascarella, Craig muMs Grant, Elise Hudson, Damaris Lewis, Frederick Weller, Nick Turturro, Alec Baldwin, Harry Belafonte and archival footage of David Duke and Donald Trump. Screenplay by Charlie Wachtel & David Rubinowitz and Kevin Willmott & Spike Lee. Distributed by Focus Features. 134 minutes. Rated R.
Spike Lee’s directorial career has been in a bit of a free-floating, confusing period for a while now. In recent years, he has tended to mix small, personal films like Red Hook Summer and The 25th Hour with artier stuff like Chiraq and Bamboozled, occasionally mixing in some generic Hollywood fare like The Inside Man and Miracle of St. Anna. None of those films were bad – in fact, many were rather good – but none connected like Lee’s classics Do the Right Thing, She’s Gotta Have It and Malcolm X. Well, I am glad to say that Spike has got his groove back. BlacKkKlansman is undoubtedly Lee’s best film in a good two decades, probably since back in the He Got Game / Clockers era. It is also his most commercially viable film in quite a few years. However, just because it’s commercially viable, that doesn’t mean that it’s not pointed politically. In this world of Black Lives Matter and the Charlottesville riots (footage of the protests is used as a direct connection to the 1970s-period story told here), Lee’s sociological knife is sharp. The movie poster tells you, in large letters, that this movie is “Based on a crazy, outrageous, incredible true story!” Often this type of claim is just hyperbole, but in this case, it is indeed true, though the film takes a certain amount of liberties with the facts of the case to keep the fun and funky 70s exploitation vibe going. It takes a certain amount of guts to take such a vital subject and film it like an episode of The Mod Squad, but Lee’s ability to not take himself – or his subject – too seriously only adds to the power of his accomplishment. By treating the Klansmen as absurd and sometimes as buffoons, he is able to defang some of the hatred and ignorance behind their stances. 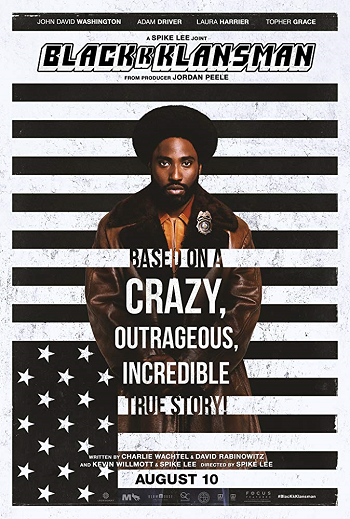 BlacKkKlansman tells the true story of Ron Shelton (John David Washington) – though, admittedly, it tells it rather broadly – a black undercover cop in 1970s Colorado who infiltrated the KKK. Obviously, that is not exactly an easy thing for a man who looks like him to do, but Shelton was able to convince the local group that he was a recruit on the phone, and then had a fellow officer named Flip Zimmerman (Adam Driver), a non-religious Jew, to act as Shelton in person. Between the two of them, they gained enough clout in the group to gain the trust of David Duke (Topher Grace), the head of the Klan. From here, Lee pulls off a wonderful balancing act, taking his subject extremely seriously, even when he does not necessarily film the action in a staid, scolding style. BlacKkKlansman is something of a comedy, even though it is about a very unfunny topic. While occasionally Lee’s potshots are a little overly broad – I find it hard to believe a 1970s Klan meeting would include the group hooting and hollering through a screening of the blatantly racist silent film Birth of a Nation, which was then about 60 years old – for the most part Lee’s satire is right on target. Then the gut punch. The film ends with news footage of Donald Trump’s speech (“There is blame on both sides”) about the Charlottesville riots. It points out that despite the fact we had hoped that we had gotten past these things, racism is still a massive problem in modern life, over 40 years after the action taking place in the film. In fact, it has ramped up exponentially in the last few years. And that is the most shocking, horrifying part of BlacKkKlansman. Copyright ©2018 PopEntertainment.com. All rights reserved. Posted: August 10, 2018. Tags: Adam Driver, Alec Baldwin, America First, Arthur J. Nascarella, Ashlie Atkinson, Bamboozled, Black Klansman, Black Lives Matter, BlacKkKlansman, Charlottesville, Charlottesville march, Chiraq, Corey Hawkins, Craig "Mums" Grant, Damaris Lewis, David Duke, do the right thing, Donald Trump, Elise Hudson, Frederick Weller, Harry Belafonte, Jasper Paakkonen, John David Washington, KKK, Ku Klux Klan, Laura Harrier, Malcolm X, Michael Joseph Buscemi, Miracle of St. Anna, Nick Turturro, Paul Walter Hauser, red hook summer, Robert John Burke, Ron Shelton, Ryan Eggold, She’s Gotta Have It, The 25th Hour, The Inside Man, The Mod Squad, topher grace. Bookmark the permalink.